Tutu, n. A very short skirt worn by a ballerina, made of projecting layers of stiffened sheer material (Collins English Dictionary) … and ‘coveted by all girls, little and big, the world over’! If getting the first rehearsal tutu is a special, unique moment in a dancer’s life (not taking into account the first frothy creations little girls typically wear), then the wearing of her first ‘built’ tutu is a true rite of passage, prompting a feeling of exhilaration that never goes away. Tutus can have a life of over 20 years, meaning that several generations of dancers will wear the same tutu, even if the layers of net are often replaced. There is both honour and superstition in wearing such a garment, and the names of all previous wearers are left inside the bodice when possible. The first thing a dancer will normally do at a costume fitting, is to look inside the costume to see who (perhaps a now famous dancer) had worn it before them. It often surprises people that ballet costumes are not remade for each dancer, but the style of construction means that these costumes are expected to have a life of 20-30 years and are made to allow alterations for each new cast. 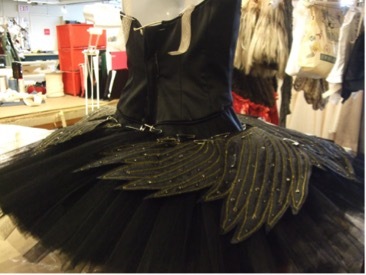 Principal dancers in a performance will normally have their own tutus, but others will have to share a costume with up to four other dancers for the run of a show. Next time you are at the ballet, take your opera glasses and you will get a glimpse of the rows and rows of bars down the back of the costume to accommodate each dancer, as in the image below. The tutu itself falls into two main types: the Romantic tutu, which consists of long layers of silk tulle, as popularised in the 19th century (think La Sylphide and Giselle), and the classical tutu which is the short ‘pancake’ style developed in the 20th century. The making of a classical tutu is a closely guarded secret and the construction has changed little over the last 100 years. Much as the first wearing of a classical tutu is a rite of passage for a dance student, so is the learning of its construction for a costume maker. The tutu is made up of three main elements: the bodice, the basque (a smooth section of the same fabric extending from the bodice to the top of the hip bone) and finally, the plate (the quintessential frilled ‘tutu’ layers). In a classical tutu, the top layers of the plate range between 13 and 15 inches from the hip to the hem of the skirt. In Russia, however, dancers like plates that reach a staggering 18 inches. I was once told by a designer that the Russian ballerinas don’t like to be able to see their feet! 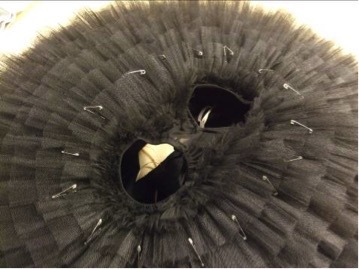 Beneath this are 10 -13, sometimes more, graduated layers of gathered net called tulle with a sprung steel hoop inserted into the middle layer to give the tutu its lift. Some tutus often have tiny frills extending underneath so that the dancers’ legs emerge from a sea of frills. 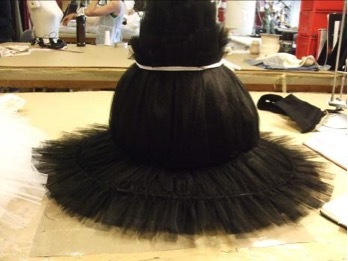 An average tutu contains over 25 meters of tulle. The layers of painstakingly gathered net are then stitched onto the knickers, normally also made out of a soft net. This is a hugely time consuming (and very scratchy) task, and few ballet companies make plates in-house any more, preferring to buy them from specialist makers. I was lucky enough to have an apprenticeship with one of the last companies which do make their own plates and the ‘tutu lady’ would sit with her protective red cotton arm covers engulfed in a mass of frothy net. This is the art of stitching the layers of net together in a plate so that they move as one, not separating when the dancer jumps or turns. The decreasing layers of net are stitched loosely together by a series of individual loops of thread or tacks. Each company has their own style and pattern of tacking. When I was initiated into the secret of tacking, it felt like a huge rite of passage. A whole day was set aside to learn the art form and a senior maker arrived at my table with an old book containing this carefully guarded method. With each layer I finished, I had to take the tutu off the mannequin and check it against a mirror to see how it moved. 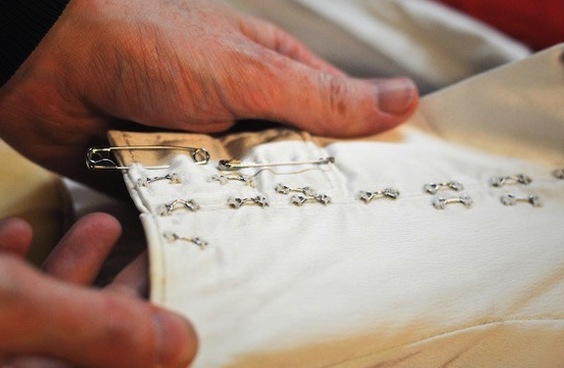 Once tacked, the plate is then attached to the finished basque and bodice by hand. The bodice is often made of satin backed with calico or canvas, which assists in preserving the life of the fabric. The bodice is made of panels stitched together in order to fit the dancer’s body perfectly and is fastened at the back with hooks and bars. 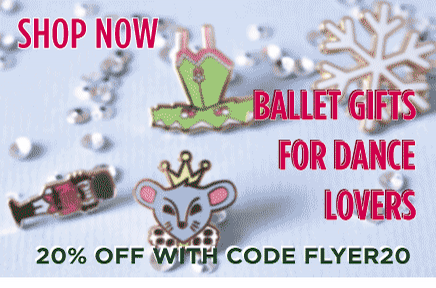 This allows an exact fit to each dancer and is easy to undo in quick changes. The bodice and basque can also be removed as one for alterations and cleaning. Little decoration is normally seen around the basque, as this is where the male dancer places his hands during partnering work, so any lace or beading would cut or catch. 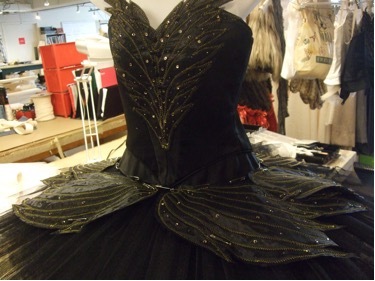 A completed tutu takes approximately 120 hours to ‘build’ and often involves 3 or 4 different makers, each responsible for a separate element. Next time you go to the ballet and you admire the ballerina’s tutu, stop and think that behind this beautiful dreamlike figure is the sum of: up to 6 different makers, hundreds of hours of work, thousands of pounds, many meters of tulle and countless stitches! Caroline is a social historian with a passion for ballet and costume. 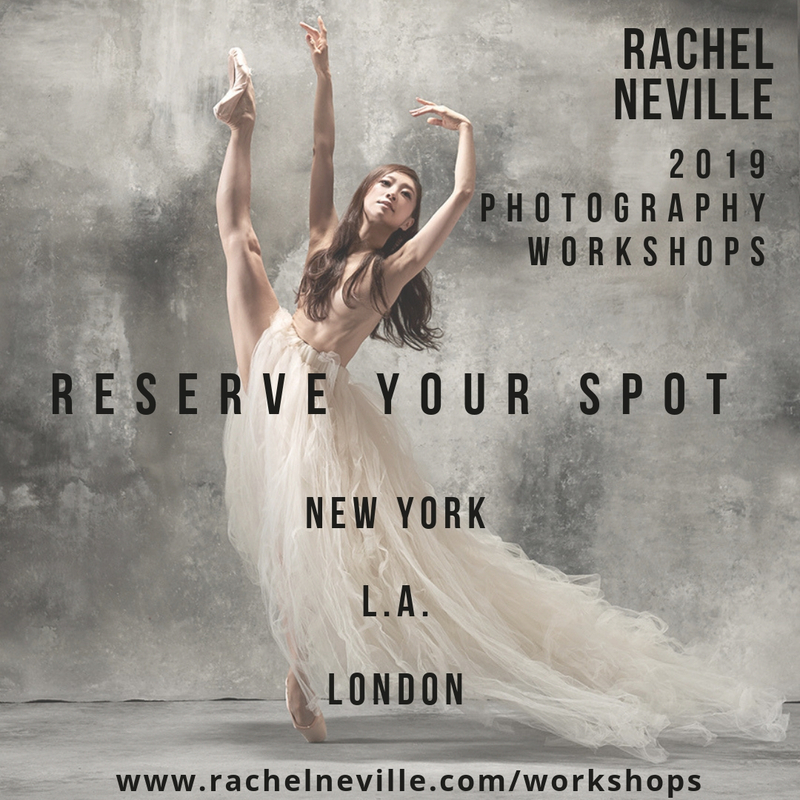 Born in Australia to a very theatrical family, she trained as a costume maker and worked with The Royal Winnipeg Ballet, The National Ballet of Canada, and many other companies. She now specialises in early twentieth century ballet. 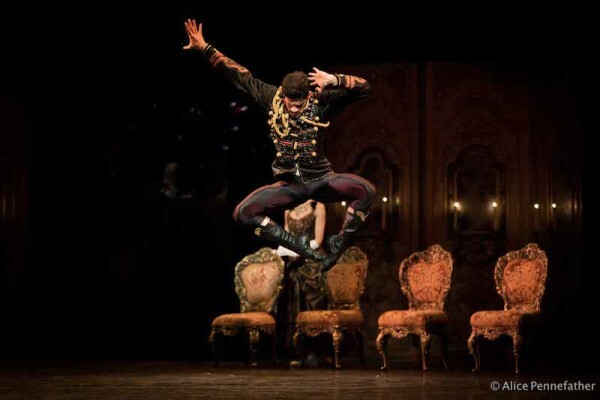 Caroline was an historical consultant for Alexei Ratmansky’s reinterpretation of Diaghilev’s 1921 production of The Sleeping Princess for ABT and Le Coq d’Or (The Golden Cockerel) for The Royal Danish Ballet. She has also worked as researcher and writer for the Pavlova 2012 project. Caroline has a Master's degree in Australian History and loves to use dance as a lens for examining social and political history. Her most recent work has involved examining the Aboriginal Political rights movement and the corresponding contemporary dance movement in Australia.